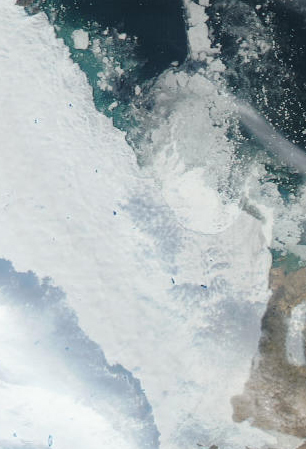 Humboldt Glacier in northwest Greenland terminates in a 100 km wide calving front in the sea. This is the longest such calving front in Greenland, capturing our imagination for potential havoc. The lack of confining topography prevents the development of the strong ice stream flow we see on Jakobshavn Glacier or the weaker ice stream flow of Petermann Glacier and its subsequent long floating tongue. Humboldt Glacier’s unique calving front leads to a different set of feedbacks to climate change that are worth examining. Pelto and Warren (1991) (Do not laugh at my figures in that paper, that is back in the drafted with ink days) noted that water depth at the calving front even in the case of polar or floating tongues provides a good estimate of calving velocity. More than width we then need to look at the water depth at the front for answers. 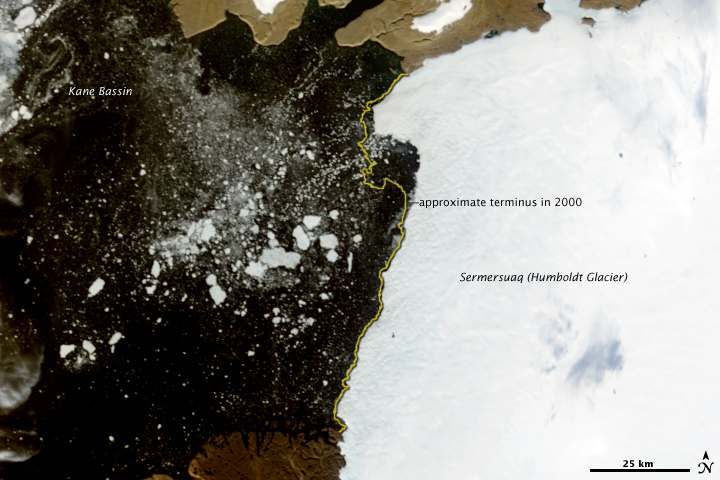 Below is Humboldt Glacier in 2008 from a NASA image. The active portion of the terminus begins above the tag on the image 2000 approximate terminus position. From when observed by Koch in 1912-13 the glacier changed little over the next 60 years. The glacier is a principal source of icebergs to the Kane Basin. Generally the icebergs are tabular icebergs less than 1 km in their largest diameter. Most icebergs come from the northern portion of the calving front is fed by an active ice stream, a nice view of these is from Jason Box at OSU. The glacier has lost 200 square kiometers of area since 1982, mostly since 2000, including this summer’s losses. What is particularly noteworthy is the amount of eroded sediment raising the turbidity and color of the water to that of coffee at the calving front in 2009 in the images from Jason Box and of Nick Cobbing of Greenpeace. This is indicative of where major subglacial meltwater streams enter the ocean. . To understand the dynamics of Humboldt Glacier its pattern of velocity, ice thickness and ice bed depths need to be identified. Ian Joughin et al (2010) provide a detailed velocity map of Petermann and Humboldt Glacier shown below. The Petermann is the narrower tongue flowing towards the top, Humboldt to the left. The velocity does not exceed 80 m/year in the southern half of the calving front. 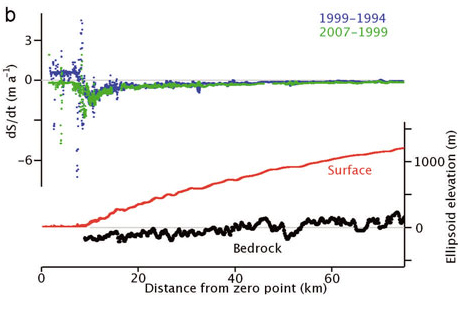 The northern portion increases from 80 m/year at the equilibrium line to 200-300 m/year at the calving front. The low velocity of the southern half of the terminus indicates a terminus that is firmly grounded, not just at the glacier front, but also all along the flowline. 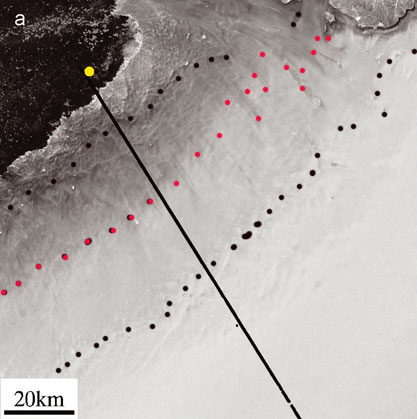 The basal topography and surface topography of the ice sheet was captured by Thomas et al (2009). The graph below indicates that the bed is generally below sea level for 40 km inland of the calving front. The bed is not smooth. 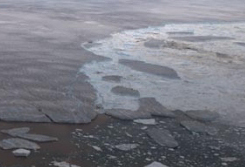 The bed is not deep, usually less than 200 m. The result is that ice less than 240 m thick cannot be afloat. The lack of smoothness and lack of a trough penetrating deep into the ice sheet indicates the lack of streaming flow dynamics that would erode and smooth such a channel. Behind the calving front the glacier slope is quite low the surface not reaching 1000 m until 60 km back of the calving front. In this span there is no specific bench of higher elevation either. The snowline, evident in the image below, on this glacier tends to be at 600 m. This is only 40-45 km inland from the calving front, compared to the 80 km long ablation zone on Petermann Glacier. There are three dotted lines I have added to this image. The first nearest the calving front indicates a clear zone of surface roughness that has to reflect the glacier is grounded and passing over a bedrock knob of sorts. The second is the transient snow line for that day. The third is the ela. Note the slightly wider distance to the ela on the north side indicating the lower slope and deeper bed that promotes the higher velocities in the area. One would anticipate an expansion of the calving embayment in the area where the embayment exists today, with retreat occuring mainly in this section. The size of the tabular bergs argues that at least locally the glacier is close to being afloat or is afloat at least sometimes during the tidal cycle. We have a comparatively slow moving, not particularly thick, but wide glacier. The glacier does not have a deep bed penetrating to the core of the ice sheet. The volume produced by Humboldt compared to Jakobshavn and Petermann puts it in perspective. Jakobshavn annual flux 40 km3,(flux= annual depth average velocity x width x mean depth) Petermann Glacier has close to 12 km3 at the grounding line, but less than 1 km3 reaches the calving front, after all the melting along the ice tongue. With a shorter ice tongue the calving flux should rise.. Humboldt Glacier is closer to 4 km3. Helheim Glacier has been assessed at 26 km3. 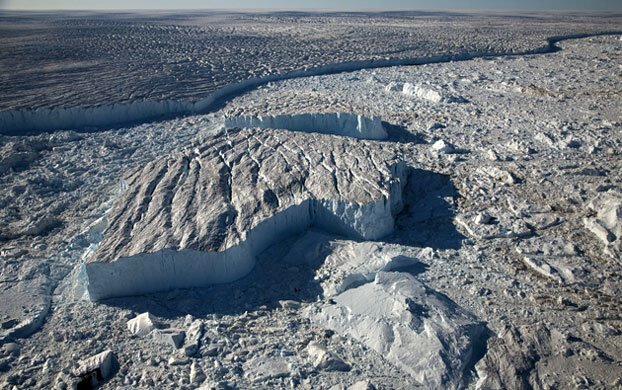 Thus, though the Humboldt Glacier has a magnificent and impressive front and taps into the core of the northwest corner of the ice sheet. It does not at present have the ability to discharge ice at volumes comparable to Jakobshavn or Helheim. The glacier does not have either a large floating section or a large ice stream section that lends itself to large rapid retreat or acceleration. The recent history of area and volume loss noted by Box indicates this glacier is more prone to a steadier progressive loss than many other outlet glaciers. The glacier continues to produce an impressive volume of icebergs as seen in the Nick Cobbing image below The depth at the calving front is a key variable and provides a good first estimate of average calving velocity. In the Pelto and Warren (1991) study four other polar glaciers have water depths that are in the vicinity of 100 m and have velocites at the calving front of 100-300 m/year. Humboldt fits this pattern. For Humboldt the relatively shallow water today across most of the front and in the future, noting depths behind the front, indicates the velocity of this glacier will remain comparatively low. Even the northern section has a limited section of higher velocity in width (25 km greater than 200 m) and distance inland from the ice front (50 km maximum). This region is centered on the main calving embayment. The northern margin is again well grounded. Thanks to Neven and Pat Lockerby for all the inspiring arctic image work this year.